Floods usually take homeowners by surprise, so possessions that are stored or used in affected areas of the home will be damaged by water. The main difficulty with cleaning up after a flood is the fight against time, so you’ll have to be strategic about your efforts. Turn off the power at the electrical panel when it’s safe to do so. If you’re not familiar with electrical maintenance, call your local utility company or electrician for assistance in shutting the power down. It’s important to do this in case you’ve left appliances plugged into the outlets because there may be a risk of shock if you come into contact with the water. Furthermore, floodwater is often unhygienic as much of it hasn’t been treated, so make sure to take proper precautions to minimize exposure. Anything that sits below the level of the floodwater will get wet, and absorbent items in the flooded room will hold onto the water. When there is less moisture in the air, the quicker everything is going to dry. In case the weather permits (such as on a warm, sunny day), let your possessions air out in the backyard, as the circulating air will help with evaporation. And in addition to speeding up drying, it’s easier to clean the walls and floors in an empty room. Homes are made of a combination of materials with the strongest materials being the least susceptible to the elements. However, the weaker materials are the filler that completes the rest of the house. Many of the weaker materials are for easy replacement in case of renovation, but they will also let water seep past them into deeper layers which may cause greater problems over time. If the water gets into the walls or under the flooring, it may be necessary to get to the layers underneath in order to make sure you remove wet insulation or subflooring. That work should be left to professionals unless you have the experience. 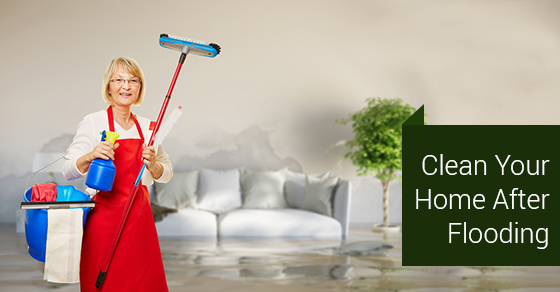 With limited time to clean up a home after a flood, it’s a good idea to call in professionals for help. Many hands make light work, and you’ll beat problems like mould or rot to the finish line.